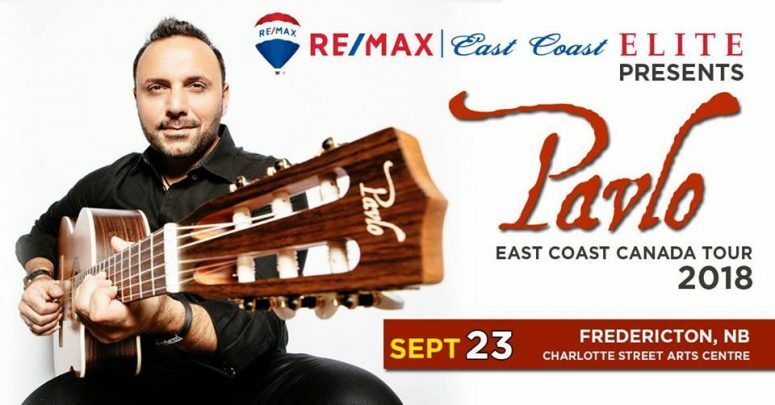 Presented by REMAX East Coast Elite Realty, on Sunday, September 23rd, 2018 at 8:00 pm come out to the Charlotte Street Arts Centre located at 732 Charlotte Street in Fredericton, for Pavlo: East Coast Canada Tour – Fredericton, NB. For being all instrumental, Pavlo’s Mediterranean music speaks for itself. Over the span of his 20-year career, Pavlo, the internationally renowned, award-winning recording artist, performer and songwriter, has released 10 albums of his own music, plus two collaborative projects, including 2015’s Guitarradas with Remigio Pereira of The Tenors, and 2009’s Trifecta with fellow guitar masters Rik Emmett and Oscar Lopez. Born in Toronto to Greek parents, Pavlo has made a name for himself by offering a musical amalgam he simply calls “Mediterranean Music” – a blend of Greek, flamenco, Latin, and even Balkan flavours, wrapped in contemporary pop. His music has taken him all around the world. Along the way he’s performed for royalty in the likes of Prince Charles and worked and toured with artists such as José Feliciano, Jon Secada, Olivia Newton-John and The Tenors.